Safety plays a big role in many families because you really want to do everything to protect your loved one. The significance of safety multiplies if there is a presence of kid/s or baby in the family. Parents must monitor the temperature in his room, the baby’s sleep, and immediately calm him down while crying. When a child grows up a little and begins to crawl, it is necessary to ensure that he does not suffer from electrical appliances or other “dangerous” devices. 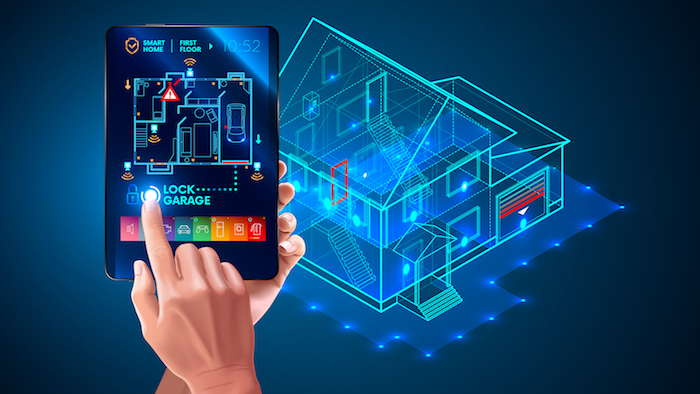 And to make the life of parents easier, many smart home researchers and manufacturers have spent years working on refined products to make more smart tools available for everyday use. With the development of residential alarm monitoring, smart door lock system, temperature control, etc., taking caring of kids have become easier at home. We have listed some smart home technologies for you and explained why they are necessary to make your house kid-friendly. Audio and video communication with the kids work much better than a baby monitor, as it allows not only to hear but also to see what the child does in the absence of parents. As soon as the baby starts tossing and turning, crying or simply waking up, the system will immediately notify the parent/s in the other room, using signal lights or pictures on the monitor. Parents will be able to immediately calm the child down by telling him/her something via two-way communication since it’s not always possible to immediately run up to the baby, for example: if you’re cooking or you are in office. For the healthy growth of a baby, it is very important to create an atmosphere in the room with a favorable level of temperature and humidity. Also, fever and elevated temperatures are not uncommon among babies and toddlers. It is especially important that the temperature is maintained for infants since any fluctuations in temperature can cause irritation or inflammation of the mucous membranes and delicate skin of the child. Researches have shown that the temperature in the room should be in the range of 20-22 ° when the baby is awake, and 16-18 ° when they arse asleep. The climate control system of the smart home is optimally suited for temperature monitoring. You only need to create a climate scenario for the nursery, and the system itself will set up radiators, floor heating, and air conditioners as needed, irrespective of the temperature fluctuations outside the home due to weather conditions. Proper lighting inside the house is necessary for the children’s mental health. The too bright or dull nursery may provoke concern or fear among the kids. Automatic control allows you to adjust the intensity of the lighting of the “smart home” depending on whether the child is sleeping or awake – this is especially true when there are young children in the family. If the baby woke up and went on a trip around the house, motion sensors will ensure the inclusion of lighting in the corridors, bathroom or other rooms. By connecting all the lamps and chandeliers to the smart home system, you can ensure proper lighting at night. There are several types of smart of lighting like noise-controlled lighting which turns itself upon the hearing of a sound, motion-controlled lighting which turns itself as soon as it detects motion, etc. Monitoring the operation of electronic devices is necessary to ensure the safety of the baby, especially when they are toddlers. The automatic control system is able to limit the contact of children with electrical appliances, setting them up for work only at a certain time, while the rest of the time electrical equipment will be de-energized to avoid accidents. This system can also be configured so that in the absence of adults, not only electrical appliances but also sockets are de-energized. Smart Home will help to ensure parental control over the daily routine. You can program the system so that at a certain time the computer and the TV in the nursery are turned off, and the lighting becomes muffled – the child will just have to go to bed. You can also turn it on if your baby is crying, and keep him/her engaged. If the children are home alone and they are not sure who is standing in front of them, they should not open the door. With Doorbell cameras, your children and you will always have the opportunity to find out who is at the door using a smartphone or tablet. These cameras are also available with an infrared night vision function to make everything clear at all times of the day. If you are not at home, and someone presses the bell, or if the motion sensor detects some movement, it sends a push message on your smartphone and you can connect via video or audio stream and talk to the visitor. By installing the Smart Home system, parents relieve themselves from many anxieties, at the same time gaining control over the actions of their child. To read more on topics like this, check out the house category.